Photo series shown at Darb 1718, Cairo, and poster action in the public space in several cities. Statement by the artist. A person’s clothing and appearance send messages asserting his or her identity or thinking, assertions addressed to a circle of relationships. Well-mastered, appearance expresses less and less a state of fact and becomes pure communication. The question is: How far can we trust it? I have observed that in recent years a lot of people in Egypt, under cover of having a new financial or religious status, changed their look radically and relatively fast and, in the same way, changed their social relationships. What can be deduced from this? At the least, that everyone has multiple faces; at the worst, that clothes make the man. In February 2010, I started an art project by not shaving my beard. A few months later, I started shooting the photo series, while brushing, dyeing and shaving my hair and beard differently at different stages throughout the year. Part of the resulting photographic series Egyptians was on view at the Darb 1718 Gallery in Cairo in December 2010, when the bomb attack against a Coptic Church in Alexandria during a New Year's Eve service killed 21 people. As a response to this attack, Moataz Nasr – the founder and director of Darb 1718 – took the initiative to make a protest poster using the photographs, adding the slogan "All Egyptians". Although for me there is a difference between the ambiguity of an artwork’s questionings and the direct communication purpose of such a poster, it is like the other side of the same coin, so I agreed as my contribution to this protest. Nabil Boutros was born in Cairo, Egypt. He lives in Paris, France. 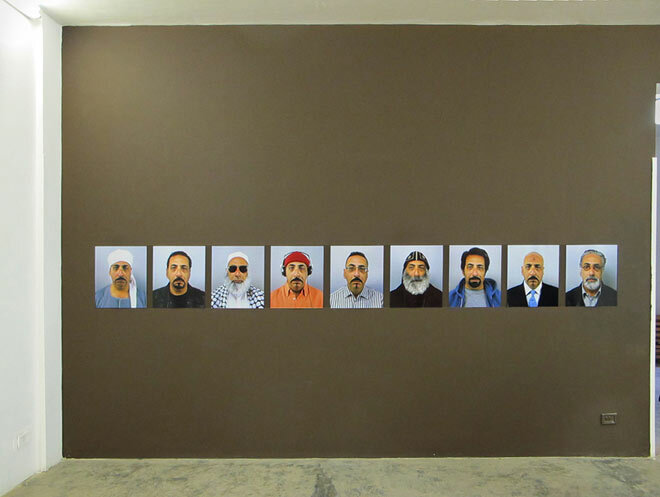 See also samples of his photographic series "Coptes du Nil" and "Egypt is a modern country!" on the image pages of this article, as well as further works on his personal website.